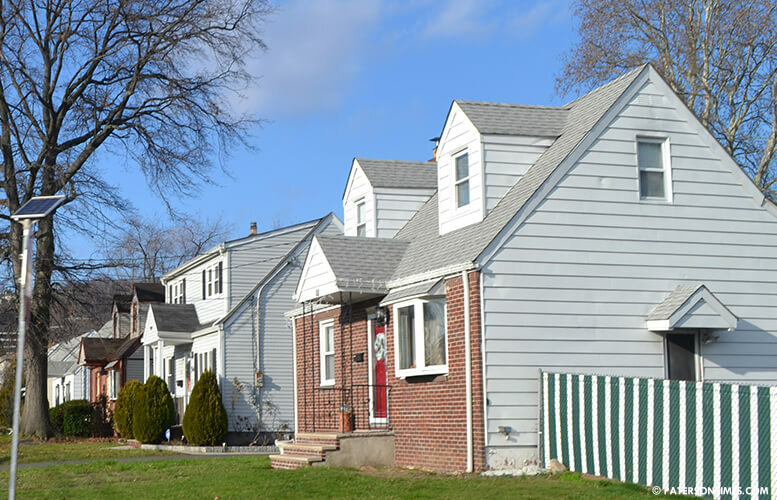 Two thirds of city homeowners are spending 30-percent or more of their gross income on housing costs making the housing cost burden for Paterson homeowners the second highest in New Jersey, according to a study conducted by New Jersey Future, a think tank. 66.1-percent of owner occupied households spend 30-percent or more of their income housing, according to the study. There are 12,499 owner households in the city, according to the study released in early December. The housing cost burden for all city households stand at 64.2-percent which suggests the burden is slightly reduced for renters. The number improves ever slightly when it comes to households headed by senior citizens, owner householder age 65 and up. 58.7-percent of elderly homeowners spend 30-percent or more of their family income on housing costs, according to the study. The median household income in the city is $34,086, according to the U.S. Census. The city is in the bottom ten when it comes to median household income, said Evans. The state’s rate of cost burdened households stand at 40.9-percent, he said. He said housing costs in New Jersey is generally higher than most other states. Miguel Diaz, president of the Eastside Neighborhood Association, said the study confirms what homeowners have been expressing over the past years. Kenneth Morris, councilman at-large, said many city property owners who live in their homes are recent homeowners. He said many bought their homes at the peak of the housing market which is probably resulting in more of their income going towards housing expenses. He also said the better number for renters has likely to do with many residents using Section 8 vouchers for housing. “Tax increases over the years also contribute towards increasing housing costs,” added Morris. Property taxes have jumped by 44-percent in the past five years, according to city records. A homeowner whose property was assessed at $350,000 paid $7,146 in taxes in 2010. In 2015, the same homeowner is paying $10,319. Mohammed Akhtaruzzaman, 2nd Ward councilman, concurred with Morris, saying the high taxes are one of the culprits making housing unaffordable for most city homeowners and renters. He said the city needs to do more to build a corporate image by increasing commercial business development rather than just focusing on housing. Mayor Jose “Joey” Torres has made building affordable housing one of his main priorities since he came into office in 2002. In his first term, he promised to build 500 units of affordable housing; more recently, he has said he intends to build hundreds of units of affordable housing. Torres has touted the number of affordable housing units he has opened in the city in many campaign speeches and multiple state of the city addresses. Torres did not respond to a request for comment. Evans said building more affordable housing is usually used as a solution to bring down housing costs, but that may not be wise in the Silk City which already has large number of affordable housing units. “You don’t want to increase the concentration of poverty,” he said. Indeed, the more housing the city builds, the more low-income families it will attract, thereby compounding the city’s existing social problems. More housing also taxes the local infrastructure as the city must provide more services. It particularly taxes the local school system – suburban towns often avoid residential developments because it increases property taxes via school spending. More families move in, more children enroll in local schools, more school taxes. Evans said the key is to get surrounding communities to build more housing. He also said building near places where there are many employment opportunities for New Jerseyans is the most prudent course to reduce housing cost burden for everyone. At some point the city has to declare it has reached its capacity, said Morris. “Paterson’s infrastructure cannot support the population it has. It’s failing because it can’t support the capacity. Now, the solution is to increase capacity, which costs money,” he said. The city’s population is 147,000, according to Census estimates; however, city officials say the city has at least 175,000 people living within its borders. Morris said the sewer system is overtaxed, garbage collection is overtaxed, and city roads are overtaxed. He said for every housing unit built, a decent wage job should be created to support that unit. “We need to change our focus from housing to improving infrastructure and improving employment opportunities and economic development to support the people who are currently here,” said Morris. Andre Sayegh, 6th Ward councilman, said the city needs to do much more to attract the creative class, through the promotion of the arts. He also said the city needs to shift its focus towards commercial developments citing the office buildings that are springing up every year in South Paterson. Sayegh often mentions increasing revenue through commercial developments to avoid hitting homeowners with tax hikes every year. Torres increased taxes by three-percent last fiscal year. Evans said taxes are not the main culprit, but the very low income of city households. Morris said the dual solutions for the city is to increase residents’ incomes through better job opportunities and reduce taxes through more commercial developments. Even if we get more large businesses to start up in Paterson, NO politician will help us by lowering our taxes to make it affordable to stay here. People are selling because this city is bleeding us dry.